Hollywood Sierra Kitchens was established in 2004 in the hopes of helping discerning clients exceed their goals of creating functional and beautiful places for cooking, entertaining and living. We searched to find the highest quality craftspeople and manufacturers in the industry to provide the finest finished product available. As we grow, we will offer more products and services, to make Hollywood Sierra Kitchens the destination for all your kitchen and bath design needs. 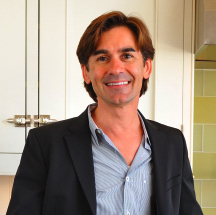 Peter Grisdela founded Hollywood Sierra Kitchens in 2004 after 20 years of experience in interior design specializing in kitchens. A native of the Detroit, Michigan area, a Certified Kitchen Designer and graduate of Detroit’s Wayne State University in Interior Architecture, Peter is now an 11-year resident of Los Angeles following several years in Boston. He brings his personal warmth and charm to his showroom that, in accordance with its name, designs for clients from the Hollywood Hills and Westside to the Sierra Nevada Mountains of Mammoth Lakes and beyond. Gerry is Business Manager and co-owner of Hollywood Sierra Kitchens, a refreshing career move after working 22 years in healthcare. Before retiring from his corporate career in 2007, he rose to VP of Operations, Network Management at a Fortune 500 health insurance company. 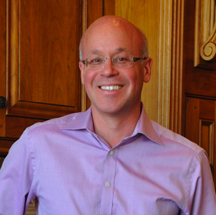 Gerry brings innovative business development ideas and extensive management experience to Hollywood Sierra Kitchens. He is a co-founder and secretary of the La Cienega Design Quarter, a vibrant design district in the area of the showroom offering high-end furniture, furnishings, art and antiques. After a successful decades-long career on the East Coast where she had owned a kitchen design business, Judith returned to Los Angeles in 2013 and joined Hollywood Sierra Kitchens. Judith tackles every project with dedication, attention to detail, due diligence and dependability. She shares the Hollywood Sierra Kitchens philosophy that the design process is collaborative, reflecting the personality and individual desires of the client while utilizing a mixture of exquisitely crafted cabinetry, color, texture and quality objects that are made to last while remaining classic in style. Docile, yet attentive, sweet (until sirens and skateboards go by! ), Scout is the welcoming “Doggy in the Window” at Hollywood Sierra Kitchens. 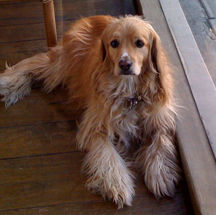 A Cocker Spaniel mix and native of Mammoth Lakes, Scout was adopted by Peter and Gerry from the local Animal Shelter in 2005. He is happy to meet new people, and their furry friends are always welcome to join him at the showroom. Located in the Heart of Los Angeles’s La Cienega Design Quarter, the 2,000 square foot Hollywood Sierra Kitchens showroom features kitchen vignettes to help our clients see the quality elements and features of a fine custom kitchen. 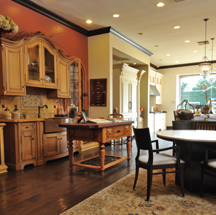 Beautiful wood finishes, countertop materials and edge details, custom hardware, and convenient product features are all displayed in a warm and inviting environment.